Gas analysis is extremely important in a wide range of industries. Making sure your gas analysis product is running safely and efficiently should be a priority. Analyzer failure can cause serious and expensive delays, damage to the environment, and danger to your employees. Recommendations for filters, sensors, and more! 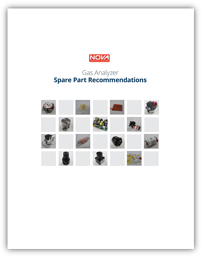 Download our Spare Parts Recommendations eBook by filling out the form to the right.